Line a roasting pan with aluminum foil for easy cleanup. Toss quartered potatoes, garlic, olive oil, salt and pepper together in the pan and roast for 20 minutes. In a large skillet cook bacon over medium high heat. Remove cooked bacon from skillet reserving 1 Tbsp of bacon grease. Remove steak to a cutting board and let it rest while you make the dressing. In a small bowl, mix sour cream, 2 to 3 Tbsp chopped green onion, olive oil, vinegar, garlic salt, pepper and about 1 Tbsp of bacon grease. Slice steak into very thin pieces. 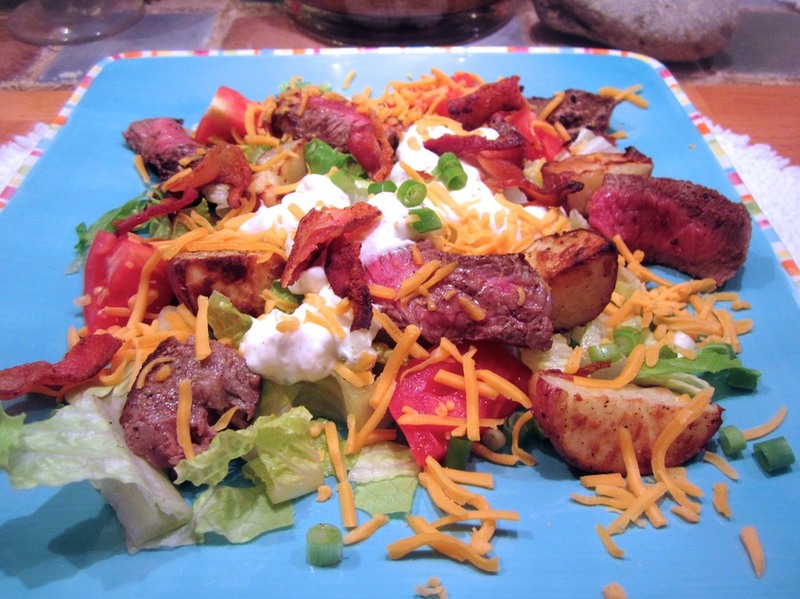 I let everyone assemble their salad by providing a large bowl of chopped lettuce, grated cheese, and salad toppings, along with the potatoes, steak, dressing, and crumbled bacon.